Childhood and the desire for magic are something that we have constructed as intertwined in our Disneyfied society, seeing magic as a manifestation of imagination which we relegate almost exclusively to the realm of children and a few eccentric artists. 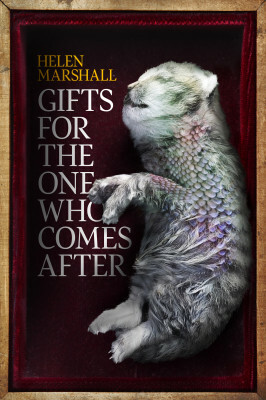 Yet, Marshall illustrates her ability to play with her reader’s perceptions in “Secondhand Magic”, a tale at first illustrating the vulnerability of youth and the threat of elderly single women… the traditional expected folkloric tale. Sayer, a child with a stutter who just wanted to perform magic steals a hat from an older neighbour’s snowman, and when she comes looking for him, she pulls the hat over him, consuming him and leaving the community in mourning. The tale constructs for us an easy view of vulnerability and exploitation, creating youth as a categorical innocence, a figure to be protected. Fortunately, Marshall shifts this expectation. The typical caricature of the witch in this narrative is uncontrollably drawn to take the actions to remove Sayer from the world, yet the boy resists any of her attempts to return him. His desire for magic creates a predatory, vampiric quality in the boy, viewing witches as sustenance for his quest for otherworldly power. Marshall inverts the expected fairy tale narrative of youthful innocence threatened by the presence of independent femininity and instead reveals the threat of a child who imagines the possibility of their own power and is willing to feed on powerful women to sustain his perception that he is entitled to power and ability without those being tempered by wisdom and the slow acquisition of skills. This entry was posted in Fiction Book Reviews and tagged aging, childhood, ChiZine, Helen Marshall, imagination, Magic, old age, reviews, Witch.